Mayor of Zagreb declares the completion of Stadion Maksimir will be cheap, but this means only two stands will be covered and no new infrastructure is planned at the ground. A new national training centre is to be erected next to the stadium. The redevelopment of north and west stands at Zagreb’s Maksimir began in late 1990s and still hasn’t finished. So far the works have consumed some 600 million kuna (€80m / $105m) and the facilities are already regarded as not modern despite significant office spaces created in corners. Now, as Zagreb prepares to host the 2016 European Universities Games (commonly mistaken by Croatian media for Universiade), the works on both stands are to finally finish. According to mayor Milan Bandić the remaining works won’t prove costly. “Completing it won’t cost much. Finishing the north stand will require some 100 million kuna, while the roof above both stands will cost further 250 million, so altogether it’s 250 million”, Bandić was quoted to say, meaning an extra €33m / $44m will be needed. We did a little visualization of how the finished stadium may look, of course it’s not official. 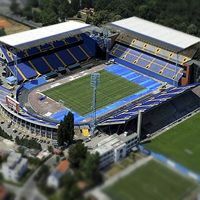 The controversial stadium renovation isn’t the only problematic project planned, nor is it the only football development at Maksimir. The national football association HNS plans to build their new training centre close to the stadium. Despite no public funding being used in this plan, it was met with criticism by local citizens. The €20 million plan is to be split 50/50 between HNS and UEFA.